Choosing a first book to recommend is at once overwhelmingly hard, and also a no brainer. Every night, before my 3-year old goes to sleep (and every nap before he goes to sleep but I’m rarely there for that), I recite The Baby Goes Beep by Rebecca O’Connell and then Goodnight Moon. 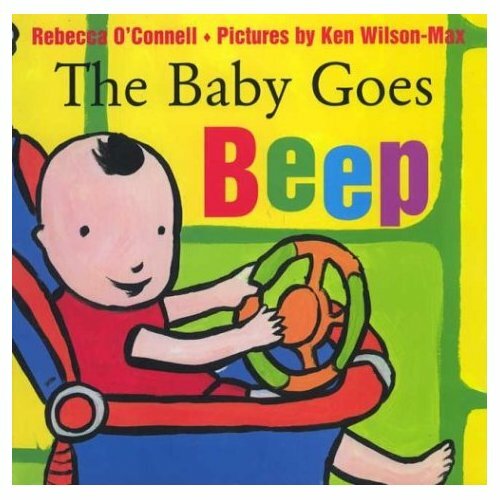 Goodnight Moon you’ve all probably heard of but The Baby Goes Beep is an unknown gem. The baby goes Beep. The baby goes Beep Beep. The baby goes Beep Beep Beep Beep. The baby goes Boom. The baby goes Boom Boom. The baby goes Boom Boom Boom Boom. The pictures are big and vivid and the story just meanders as the baby gets home, plays for a bit, eats dinner, takes a bath, gives good-night kisses and goes to sleep (actually, my kids like to point out that the mom and dad go to sleep but on the end page, the baby is standing up in the crib!). Simply put, it’s a perfect bedtime book. Everyone in my family knows it by heart by now, even our occasional babysitters do. Sadly, it’s out of print, so snap up any copies you find!